Motorcycle chic at it's best. 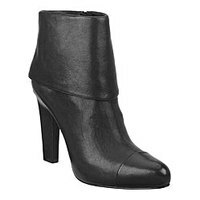 Leather upper ankle boot with detailed stitch across toe on a 4" heel. I want these booties bad but $149 does not fit into my budget. Maybe I'll wait for them to go on sale. They may be too fierce for me to pass up, especially since a size 12 is hard to find.